− Individual Control: Consumers have a right to exercise control over what personal data companies collect from them and how they use it. − Transparency: Consumers have a right to easily understandable and accessible information about privacy and security practices. − Respect for Context: Consumers have a right to expect that companies will collect, use, and disclose personal data in ways that are consistent with the context in which consumers provide the data. − Security: Consumers have a right to secure and responsible handling of personal data. − Access and Accuracy: Consumers have a right to access and correct personal data in usable formats, in a manner that is appropriate to the sensitivity of the data and the risk of adverse consequences to consumers if the data is inaccurate. − Focused Collection: Consumers have a right to reasonable limits on the personal data that companies collect and retain. − Accountability: Consumers have a right to have personal data handled by companies with appropriate measures in place to assure they adhere to the Consumer Privacy Bill of Rights. – Data Portability. We can take copies of that data out of the company’s coffers and offer it to others or just keep copies for ourselves. – Data Editing. We can request deletions, editing, clarifications of our data for accuracy and privacy. – Data Anonymity. We can request that our data not be used, cognizant of the fact that that may mean services are unavailable to us. – Data Use. We have rights to know how our data is being used inside a company. – Data Value. The right to sell our data to the highest bidder. – Data Permissions. The right to set permissions as to who might use/benefit from/have access to our data. Comparing the two, it seems the Administration has not addressed the issue of what I call portability, at all, which I think is a bummer. Nor does it consider the idea of Value, which I think the market is going to address over time. It does address what I call editing, anonymity (what I should have called “opt out”), use, and permissions. What the administration added that I did not have is “security” – the right to know your data is secure (I think I took that for granted), and “Focused Collection” and “Respect For Context,” which I agree with – don’t collect data for data’s sake, and we should have the right that data collected about us is being used in proper context. Given how much this issue is in the news lately, as well as the overwhelming response to my post last Friday about Google and Apple, I’m getting as smart as I can on these issues. 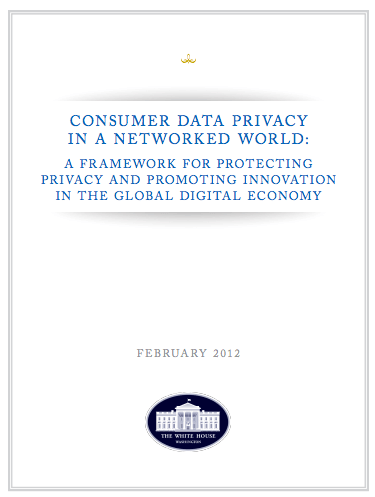 Further coverage of the Administration’s move at RWW: Obama Administration Sides with Consumers in Online Privacy Debate and Paid Content Big Tech, Obama And The Politics Of Privacy as well as Ad Age, which is skeptical: Did The White House Just Thread The Needle On Privacy? Great post. I think the argument over our data (and how it’s used) will (or should) be looked at using the Penumbra theory. The theory seems to come into play most during controversial disputes (i.e: http://en.wikipedia.org/wiki/Griswold_v._Connecticut & http://legal-dictionary.thefreedictionary.com/penumbra). Data Rights – it’d be great to see a new standard where privacy policies go down a full check list of all these data rights. and allow people to pay for the ability to enable certain non-standard rights. I love the idea of Data Value. I’ve been wanting something like this for a long, long time. The ‘privacy is dead’ meme will get a run for it’s money once a framework is in place that allows people to put a dollar value on their privacy/data.